یگانه فعال, علی, موجدیان, مریم, کلهر, مهدی, عطاران, عبدالمحمد, تبارکی, رضا. (1395). تهیه مشتق تازه ای از بازشیف تیوفن تترا هیدرو بنزو و کاربرد آن در اندازه گیری فلوئورید در خمیردندان به عنوان یک حسگر تازه فلورسانی فلوئورید. 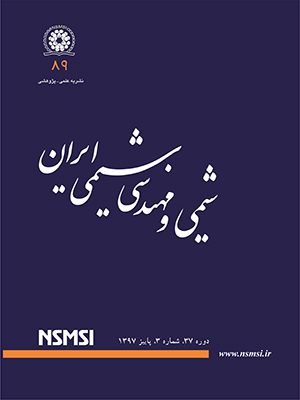 نشریه شیمی و مهندسی شیمی ایران, 35(3), 65-75. علی یگانه فعال; مریم موجدیان; مهدی کلهر; عبدالمحمد عطاران; رضا تبارکی. "تهیه مشتق تازه ای از بازشیف تیوفن تترا هیدرو بنزو و کاربرد آن در اندازه گیری فلوئورید در خمیردندان به عنوان یک حسگر تازه فلورسانی فلوئورید". نشریه شیمی و مهندسی شیمی ایران, 35, 3, 1395, 65-75. یگانه فعال, علی, موجدیان, مریم, کلهر, مهدی, عطاران, عبدالمحمد, تبارکی, رضا. (1395). 'تهیه مشتق تازه ای از بازشیف تیوفن تترا هیدرو بنزو و کاربرد آن در اندازه گیری فلوئورید در خمیردندان به عنوان یک حسگر تازه فلورسانی فلوئورید', نشریه شیمی و مهندسی شیمی ایران, 35(3), pp. 65-75. یگانه فعال, علی, موجدیان, مریم, کلهر, مهدی, عطاران, عبدالمحمد, تبارکی, رضا. تهیه مشتق تازه ای از بازشیف تیوفن تترا هیدرو بنزو و کاربرد آن در اندازه گیری فلوئورید در خمیردندان به عنوان یک حسگر تازه فلورسانی فلوئورید. نشریه شیمی و مهندسی شیمی ایران, 1395; 35(3): 65-75. در این پژوهش از یک ترکیب که برای اولین بار تهیه و گزارش شده است به عنوان یک حسگر فلورسانی برای اندازه گیری فلوئور استفاده شده است. فلوئورید، یک ماده معدنی طبیعی است که در پوسته زمین به فراوانی یافت می شود. عنصر فلوئور و یون آن بسیار سمی بوده و در منطقه‌ هایی که میزان فلوئور کم باشد، پوسیدگی دندان‌ ها دیده می ‌شود. مانند هر ماده دیگر، اگر فلوئورید بیش از اندازه و بی رویه مصرف شود مسمومیت ایجاد می ‌کند.این موضوع نشان دهنده اهمیت اندازه گیری فلوئورید در نمونه‌ های دارای فلوئورید به ویژه خمیر دندان است. یک حسگر جدید فلورسانی حساس فلوئورید می تواند مطرح شود. Amanlou M., Hosseinpour M., Azizian H., Khoshayand M.R., Navabpoor M., Souri E., Determination of Fluoride in the Bottled Drinking Waters in Iran, Iranian Journal of Pharmaceutical Research (IJPR), 9(1): 37-42 (2009). Peckham S, Awofeso, N. Water Fluoridation: A Critical Review of the Physiological Effects of Ingested Fluoride as a Public Health Intervention, The Scientific World Journal, 10 (2014). حسن پهلوان زاده، حمید رضا زارع نژاد اشکذری، فلوراید زدایی از آب آشامیدنی با ستون جذب بستر ثابت با استفاده از جاذب ارزان قیمت بوکسیت، نشریه شیمی و مهندسی شیمی ایران، (2) 31: 17 تا 24 (1392). Bentley E.M., Ellwood R.P., Davies R.M., Oral Hygiene: Fluoride Ingestion from Toothpaste by Young Children, Br Dent J., 186(9): 460-2 (1999). Freire I.R., Pessan J.P., Amaral J.G., Martinhon C.C.R., Cunha R.F., Delbem A.C.B., Anticaries Effect of Low-Fluoride Dentifrices with Phosphates in Children: A Randomized, Controlled Trial, Journal of Dentistry, 50; 37-42 (2016). Mowry J.B., Spyker D.A., Cantilena L.R., Jr., Bailey J.E., Ford M., "2012 Annual Report of the American Association of Poison Control Centers' National Poison Data System (NPDS)": 30th Annual Report. Clin Toxicol (Phila), 51(10): 949-1229 (2013). Sebastian S.T., Siddanna S., Total and Free Fluoride Concentration in Various Brands of Toothpaste Marketed in India, Journal of Clinical and Diagnostic Research (JCDR), 9(10): ZC09-ZC12 (2015). Gomez-Hens A., Valcarcel M., Spectrofluorimetric Determination of Inorganic Anions: A Review, Analyst., 107(1274): 465-94 (1982). Yahyavi H., Kaykhaii, M., Mirmoghaddam M., Recent Developments in Methods of Analysis for Fluoride Determination, Critical Reviews in Analytical Chemistry, 46(2):106-21 (2016). Themelis D.G., Tzanavaras P.D., Simultaneous Spectrophotometric Determination of Fluoride and Monofluorophosphate Ions in Toothpastes Using a Reversed Flow Injection Manifold, Analytica Chimica Acta, 429(1): 111-6 (2001). Švarc-Gajić J., Stojanović Z., Vasiljević I., Kecojević I., Determination of Fluorides in Pharmaceutical Products for Oral Hygiene, Journal of Food and Drug. Analysis, 21(4): 384-9 (2013). Yang X-F., Qi H., Wang L., Su Z., Wang G., A ratiometric Fluorescent Probe for Fluoride Ion Employing the Excited-State Intramolecular Proton Transfer, Talanta, 80(1): 92-7 (2009). Qiu B., Zeng Y., Cao L., Hu R., Zhang X., Yu T., Chen J., Yang G., Li Y., A Colorimetric and Ratiometric Fluorescence Sensor for Sensitive Detection of Fluoride Ions in Water and Toothpaste, RSC Advances, 6(54): 49158-63 (2016). Li Y., Duan Y., Zheng J., Li J., Zhao W., Yang S., Yang R., Self-Assembly of Graphene Oxide with a Silyl-Appended Spiropyran Dye for Rapid and Sensitive Colorimetric Detection of Fluoride Ions, Analytical Chemistry, 85(23): 11456-63 (2013). Xiong Y., Wang C., Tao T., Duan M., Tan J., Wu J., et al., Fabrication of a Miniaturized Capillary Waveguide Integrated Fiber-Optic Sensor for Fluoride Determination, Analyst, 141(10): 3041-9 (2016). Gleisner H., Einax J.W., Morés S., Welz B., Carasek E., A Fast and Accurate Method for the Determination of Total and Soluble Fluorine in Toothpaste Using High-Resolution Graphite Furnace Molecular Absorption Spectrometry and Its Comparison with Established Techniques, Journal of Pharmaceutical and Biomedical Analysis, 54(5): 1040-6 (2011). Morés S., Monteiro G.C., Santos FdS., Carasek E., Welz B., Determination of Fluorine in Tea Using High-Resolution Molecular Absorption Spectrometry with Electrothermal Vaporization of the Calcium Mono-Fluoride CaF, Talanta, 85(5): 2681-5 (2011). Borges A.R., Duarte Á.T., Potes MdL., Silva M.M., Vale M.G.R., Welz B., Fluorine in Eye Shadow: Development of Method Using High-Resolution Continuum Source Graphite Furnace Molecular Absorption Spectrometry via Calcium Mono-fluoride with Direct Solid Sample Introduction, Microchemical Journal, 124: 410-5 (2016). Zaher Barghouthi S.A., Spectrophotometric Determination of Fluoride in Groundwater Using Resorcin Blue Complexes, American Journal of Analytical Chemistry, 3(9): 651-655 (2012). Barghouthi Z., Amereih S., Field Method for Estimation of Fluoride in Drinking Groundwater by Photometric Measurement of Spot on Aluminium Quinalizarin Reagent Paper, In Press, Arabian Journal of Chemistry, (2013). Har T.L., West T.S., Spectrofluorimetric Determination of traces of Fluoride ion by Ternary Complex Formation with Zirconium and Calcein Blue, Analytical Chemistry, 43(1): 136-9 (1971). Marco V., Carrillo F., Pérez-Conde C., Cámara C., Kinetic Flow-Injection Spectrofluorimetric Method for the Determination of Fluoride, Analytica Chimica Acta., 283(1): 489-93 (1993). Anand T., Sivaraman G., Iniya M., Siva A., Chellappa D., Aminobenzohydrazide Based Colorimetric and ‘Turn-on’ Fluorescence Chemosensor for Selective Recognition of Fluoride, Analytica Chimica Acta., 876: 1-8 (2015). Cury J.A. MG, Buzalaf M.A.R., Akman S., Men Y., Rigalli A., Ahmed I., Brahman K.D., Welz B., Fluorine : Chemistry, Analysis, Function and Effects. In: Preedy VR, editor. "Fluorine: Chemistry, Analysis, Function and Effects." Cambridge, United Kingdom: Royal Society of Chemistry; p. (2015). Huang W., Li J., Tang J., Liu H., Shen J., Jiang H., Microwave‐Assisted Synthesis of 2‐Amino‐thiophene‐3‐Carboxylic Derivatives Under Solvent‐Free Conditions, Synthetic Communications, 35(10): 1351-7 (2005). Lee D.H., Im J.H., Lee J.-H., Hong J.-I., A New Fluorescent Fluoride Chemosensor Based on Cnformational Restriction of a Biaryl Fluorophore, Tetrahedron Letters, 43(52): 9637-40 (2002). Lee K.H., Lee H-Y., Lee D.H., Hong J-I., Fluoride-Selective Chromogenic Sensors Based on Azophenol, Tetrahedron Letters, 42(32): 5447-9 (2001). Hu R., Feng J., Hu D., Wang S., Li S., Li Y., Yang G., A Rapid Aqueous Fluoride Ion Sensor with Dual Output Modes, Angewandte Chemie International Edition, 49(29): 4915-8 (2010). Bamesberger A., Schwartz C., Song Q., Han W., Wang Z., Cao H., Rational Design of a Rapid Fluorescent Approach for Detection of Inorganic Fluoride in MeCN-H2O: a New Fluorescence Switch Based on N-aryl-1,8-Naphthalimide, New Journal of Chemistry, 38(3): 884-8 (2014).